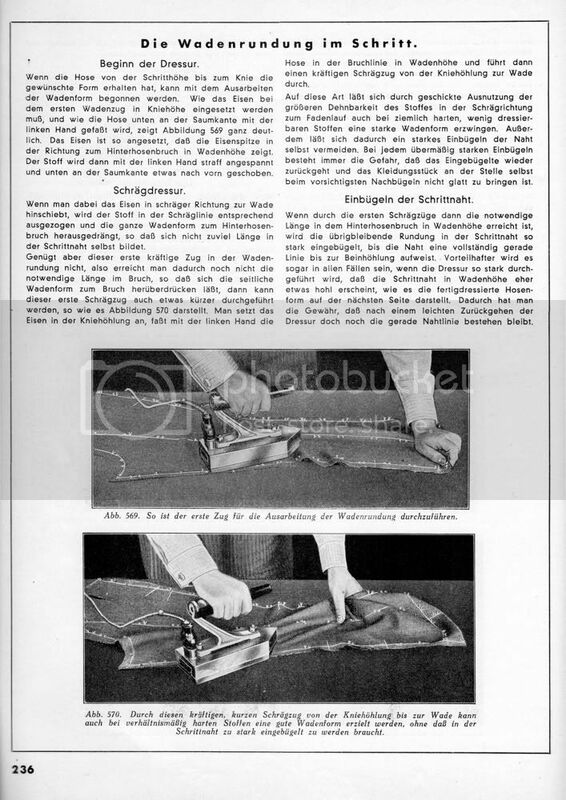 This comes from the 1950s Rundschau book Zuschnitt XII edition. 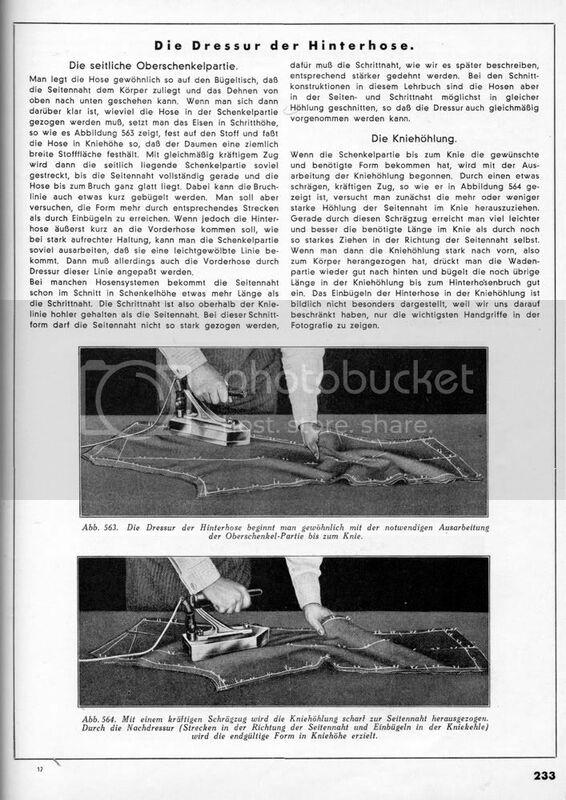 If you have found this useful, you may want to consider subscribing to the current Rundschau journals or browsing through their current books on their online store. With modern slim cut trousers, a moderate amount of ironwork is unavoidable, especially on clients with prominent calves. The topsides with a modern hem width of 48-50cm require moderate stretching of the leg and front seams beneath the knee. The fork must be moderately shrunk (or held short) in order to ensure a clean adjoining of the right and left panels. The front corner of the waistband area should be moderately shrunk (Abb 470). 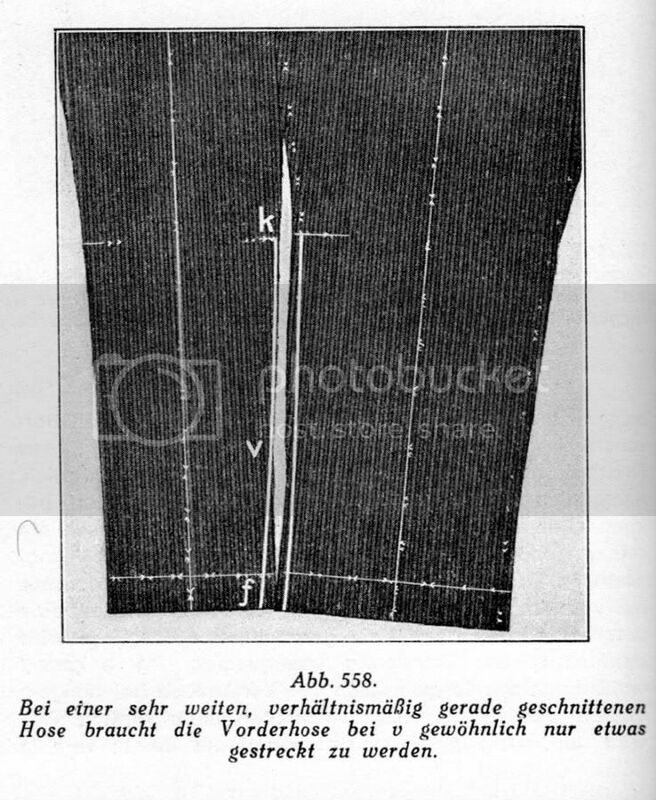 Alternatively, as the waistband is put on, the topside can be sewn short in the shown area. 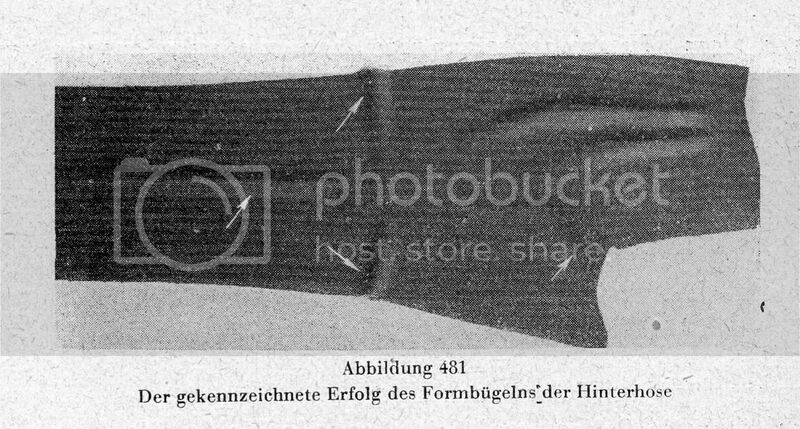 The fork of left and right is reinforced with lining (Abb 469). 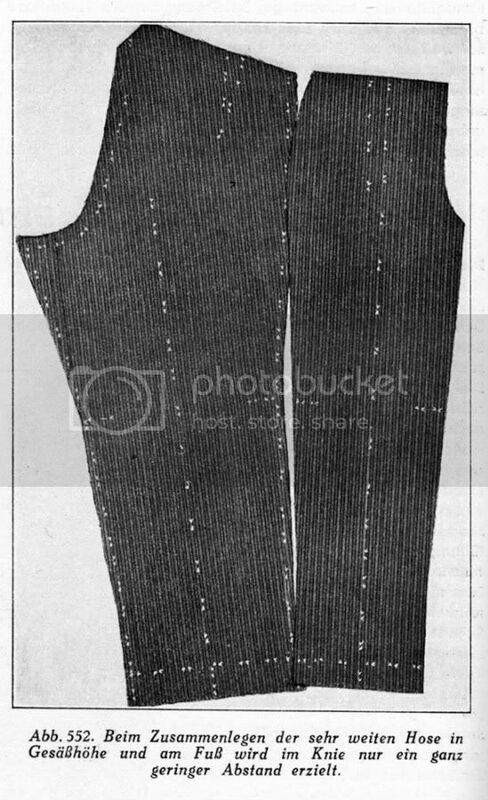 It is recommended that the lining here be doubled over on the bias to sit backwards on the angle of the inseam, before the ironwork commences. This avoids having to trim the rear corner of the lining, which tends to stand out - particularly with thin materials. 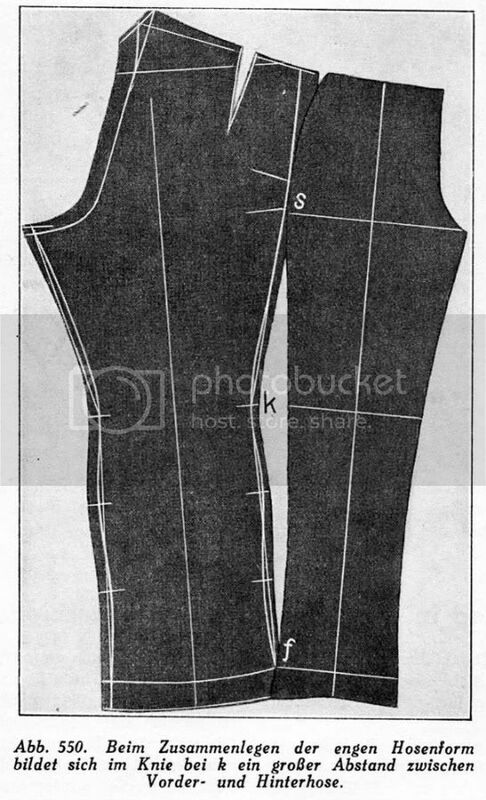 The trousers must be correctly basted so that the central and the smaller pleats lay smoothly - preferably with a machine. 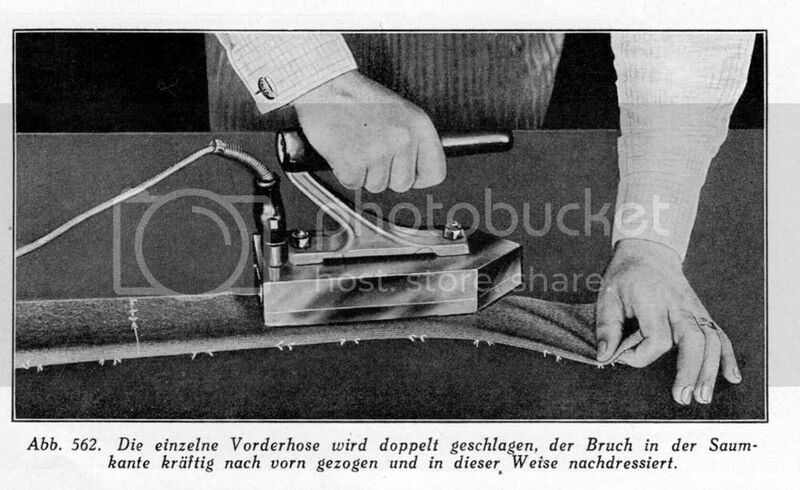 The underside of trousers have to also be worked up with the iron, especially when they are slim cut. With trousers of a hem and knee width of 48-50cm traditional ironwork has to be undertaken to lend the trousers the proper shape. This need not be too arduous a task. The ironwork described here, dependent thought it is on the nature of the cloth, contributes significantly to the fit of the trousers. The iron is moved diagonally to the highest point of the calf, and the width falling onto the side seam is shrunk in. The underside is normally cut so that the inseam at the fork is 1-2cm wider than the side seam. This ease must be brought to the place where it is really needed - the deepest round of the seat. There is moderate length at knee height in the leg and side seams resulting a hollowing just below the knee. The is more or less pronounced fullness at the calf level. There is sufficient fullness at hips and seat. There are some subtle differences but overall it is very similar to the Rundschau method shown above. 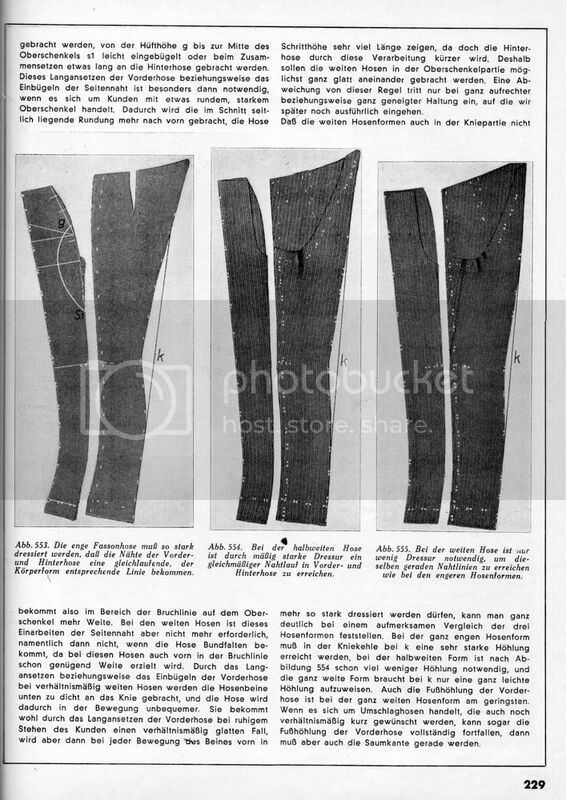 The following enormous essay on the correct technique for trouser ironwork comes from die Zuschneidekunst, 1938 published by der Schneidermeister. The correct fit of trousers cannot be achieved by cutting alone, for this must be achieved for the most part through ironwork. Many more errors in trousers have their origins in inadequate ironwork than in the cut. The most important factor in trousers is their width. Different widths demand a different method of working up with the iron, although difference in posture and body habitus also influence this. 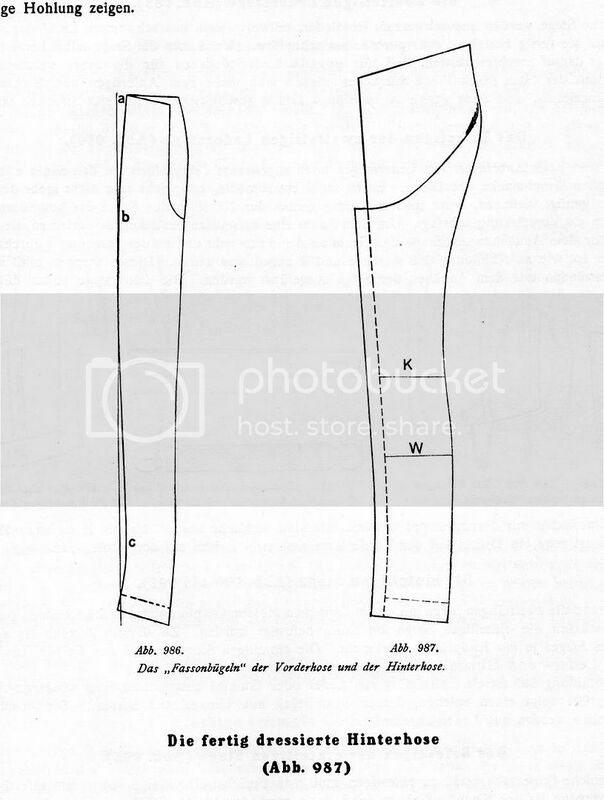 Even the most perfectly calculated cut could never create well fitting trousers without the proper ironwork. The wider the width at knee and foot relative to the seat width, the less ironwork is required. The narrower the trousers are at knee and foot, the more ironwork is required. Abb 550: On narrow cut trousers there forms at k, a large gap between top and undersides at the knee. If follows that the narrower the trouser is cut the more ironwork will be required to get the seams completely straight. The hollow at knee and roundness of calf are extremely pronounced on narrow cut trousers. The undersides must therefore be very strongly stretched or shrunk to get the seams straight in order that they should effortlessly fit together. The hollow of foot must also be attained through vigorous ironwork on the topsides. With the moderately wide form, the shape of the seams is already fairly well balanced, so less the ironwork need not be as vigorous. With the very wide form, the seams are already almost straight so very little ironwork need be conducted. The technique of ironwork will be shown later, but we will examine first the differences in the final form taken at the completion of the ironwork. 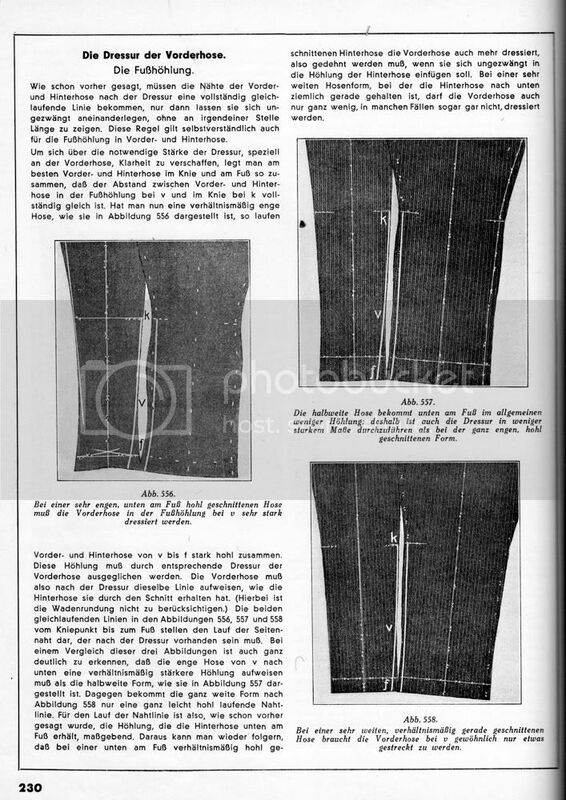 Additionally (provided there are no pleats), the topsides can be shrunk in from the letter g to the middle of the upper thigh at S1, or else the underside can be sewn long while making up - something particularly important in subjects with well developed upper thighs. On wide trousers or trousers cut with pleats this is no longer necessary, as there is already room enough there. If you were to shrink the topsides (or sew the underside long) on wide trousers it makes them too close and uncomfortable to move in at the knee. The shortness at the knee of the undersides will interfere with the forward stride of the leg with every step. With wide trousers the upper thighs are made up quite plain. The exception is with a subject of erect or stooping stance, as we will explain later. 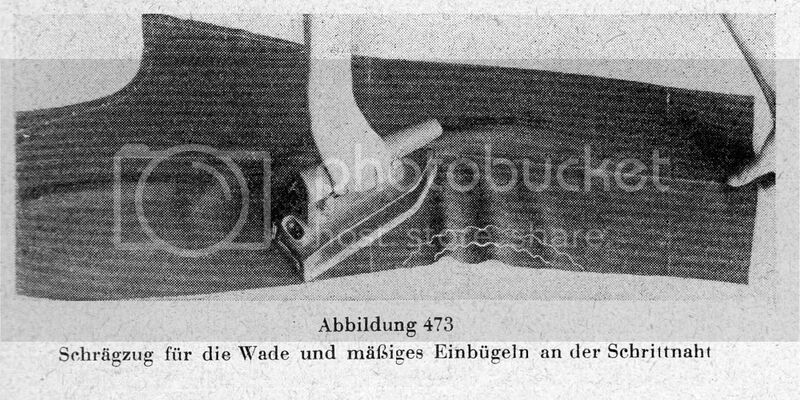 Abb 554: with moderately wide trousers, moderately vigorous ironwork will achieve an even run in the seams of topside and underside. 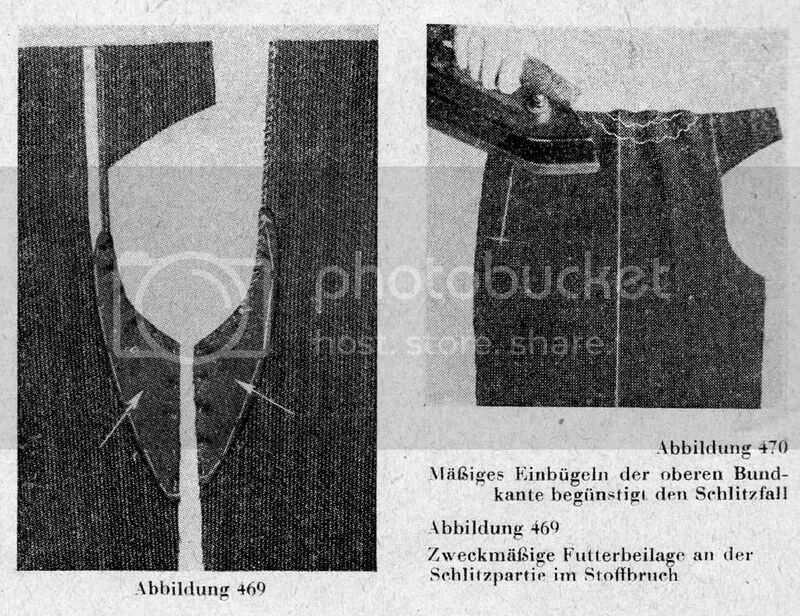 Abb 555: With very wide trousers, little ironwork is required to get the seams straight. Compare Abb 553-555, where the letter k shows the hollow of knee. You can also see that narrow cut trousers need a lot more ironwork to achieve a greater hollow of knee. Even the hollow of foot is least pronounced in the very wide form of trouser, to the point that it hardly exists any longer and the seams fall almost straight. The seams of topside and underside must form of completely straight line if they are to fit together with ease and without there being excess length on either side. This rule, of course holds true of the hollow of foot in top and underside. This means that less vigorous ironwork is required for the medium wide trousers. The topsides need only be stretched a little at the letter v.
The ironwork must be carried out with a good hot iron. An insufficiently hot iron makes the work difficult, and there is the danger that the cloth will be soiled. Delicate cloth forms flecks which are difficult to get rid of. The area should be well wetted without soaking it. Excessively dry ironing is ineffective. The seam must be pulled forcefully, with a tug that is evening widely distributed, and so that it is directly on the seam. The worked up seam of the topside must lie completely flat before moving on. This second side of the topside is worked up to be long enough that it lies just as flat as the opposite seam in Abb 560. This ironwork can be conducted with somewhat greater force as the seams tend to spring back a little to their original form. If the ironwork is conducted with special vigour you will attain the necessary form straight away without having to shrink the topside at the hollow near the hem. 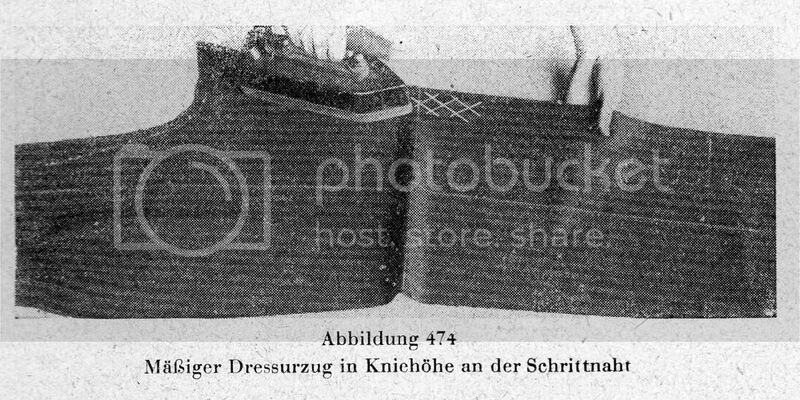 The iron should be placed firmly on the cloth, and the trousers grasped at the knee area so that the thumb firmly holds onto a large width of cloth. With an evenly forceful pull, the thigh area is sufficiently stretched so that the sideseam becomes completely straight, and the trousers lie fully flat all the way down to the break. The breakline can also be shrunk somewhat short. You should try to achieve the final form more through stretching than through shrinking. If the underside is to be made extremely short relative to the topside, as with very erect figures, the thigh area can be so worked up that it forms a gently curved line. The topside must also be worked up to fit this line. With many trouser cutting systems, the side seam is already cut in the thigh area so that it has more length than the inseam. 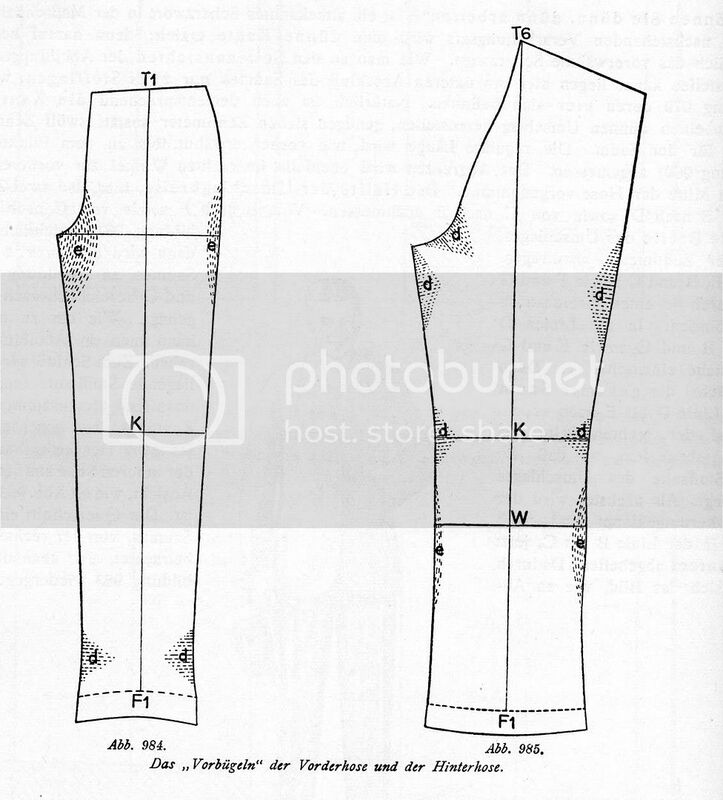 The inseam is thereby more hollow than side seam above the line of the knee. With these cuts the side seam should not be stretched as strongly. However, the inseam, as we will later see, must be stretched significantly more forcefully. 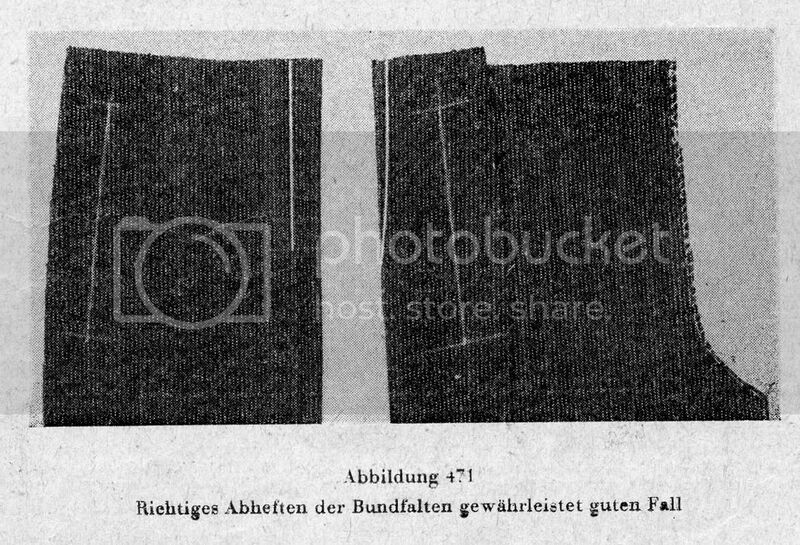 The cuts in this book are drafted so that the side and inseams have the same amount of hollow, so that the ironwork can be conducted with equal force. These bias runs of the iron achieve the desired length in the knee quicker and better than forceful pulling in the direction of the side seam. Once you have pulled the hollow of knee strongly towards the front, press the calf area well back and shrink the usual length in the hollow of knee right in up to the back trouser break. The iron is so deployed so that the tip of the iron points in the direction of the hind trouser break at calf height. The iron is passed in a somewhat angular movement from knee level to the round of the calf of underside trouser break, with even tension on the cloth. 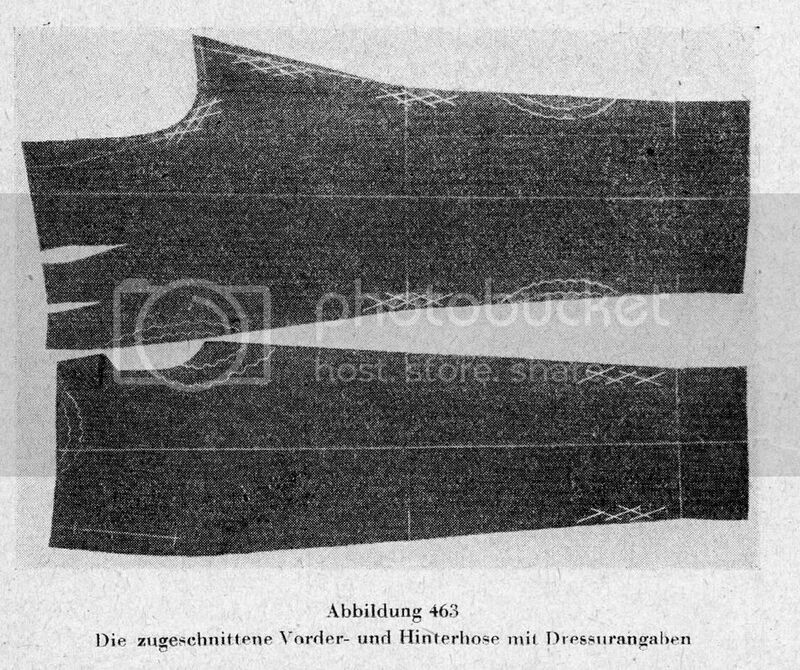 When one pulls the lower corner of the cloth tautly with the left hand, and advances the iron on an angle towards the calf, the cloth is stretched in this direction, namely along the bias. The whole of the calf is pushed over to the underside trouser break without forming too much length in the side seam. If the first forceful pass in the direction of the round of calf should prove insufficient, the angled pass can be repeated, only in a shorter pass. Place the iron at the hollow of knee, grasping the trouser with the left hand in the breakline at the calf level and make one forceful angular pass from the hollow of knee to the calf. Once one has attained the necessary length in the underside break at calf level, the remaining round of the side seam is vigorously shrunk in until one has attained perfect straightness of the side seam up to the lower hollow of leg. Note the slight curving in of the side seam at the knee, and directly above the knee. Once the outer side of the underside has the desired form, the ironwork on the inseam can begin. 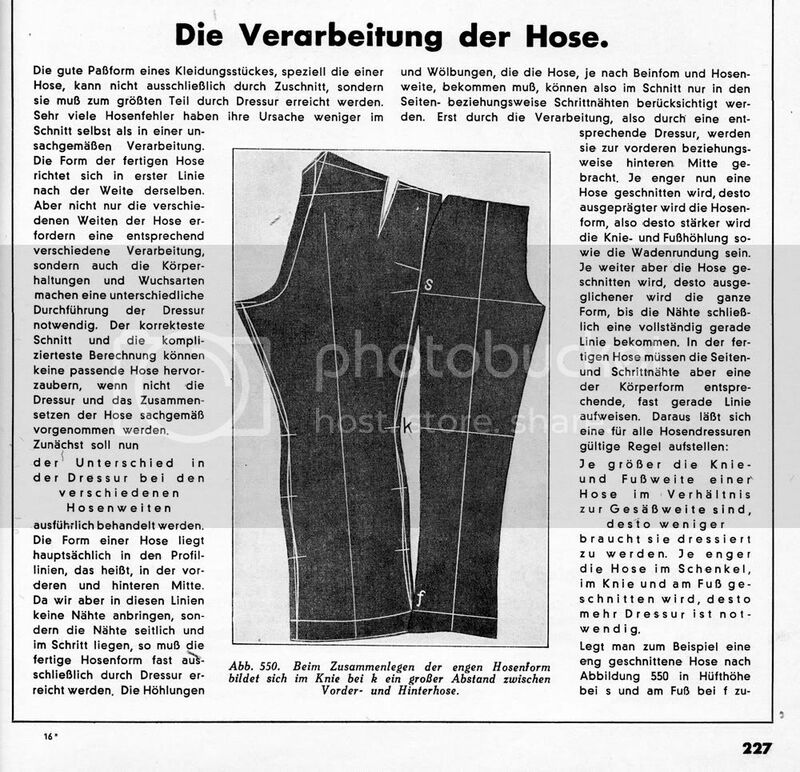 If the first ironwork on the inseam is to be carried out on the same trouser leg on which the initial ironwork to the side seam was carried out, then the inseam must be laid out away from the body, because the trouser must be worked up from top to bottom. Many tailors turn the trouser around carrying out the ironwork on the inseam of the other trouser leg. 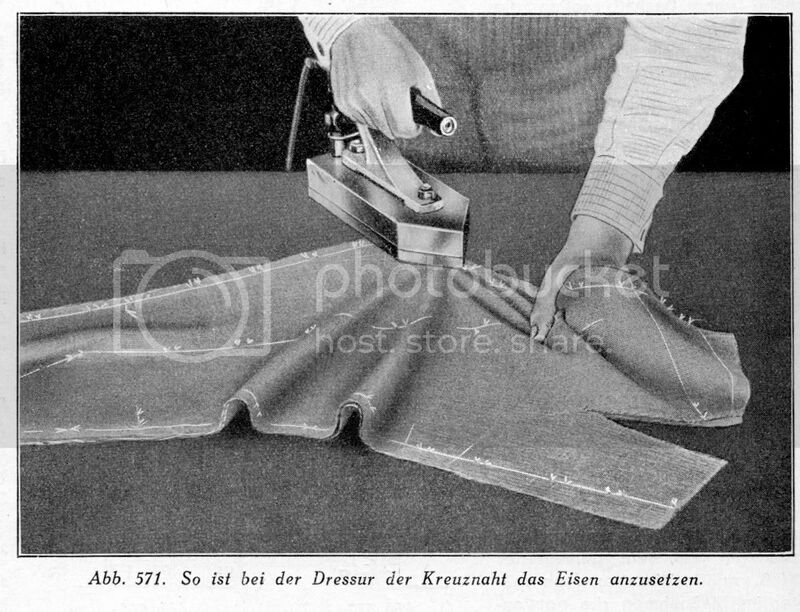 With this method, the ironwork on the inseam can be conducted in the same manner that we previously described for the side seam. Which method one chooses is a matter of preference. First you pull the calf area of the inseam evenly on the width of the iron strongly enough that inseam forms a straight line. 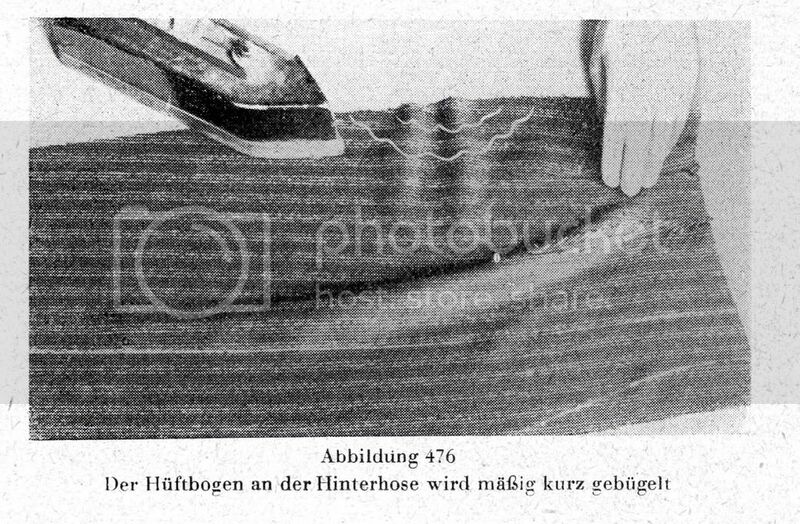 The iron is pressed down firmly at the top of inseam and the cloth pulled strongly with the left hand at knee height. If this angular pass is carried out with enough force, one can achieve the desired hollow of knee even on relatively hard cloths without having to shrink in the break line. Additionally, one can stretch the inseam above the hollow of knee so much with this angled pass that one attains a completely straight, even slightly curved in inseam. The iron is so deployed that the tip of the iron points in the direction of the underside trouser break at the height of the calf. 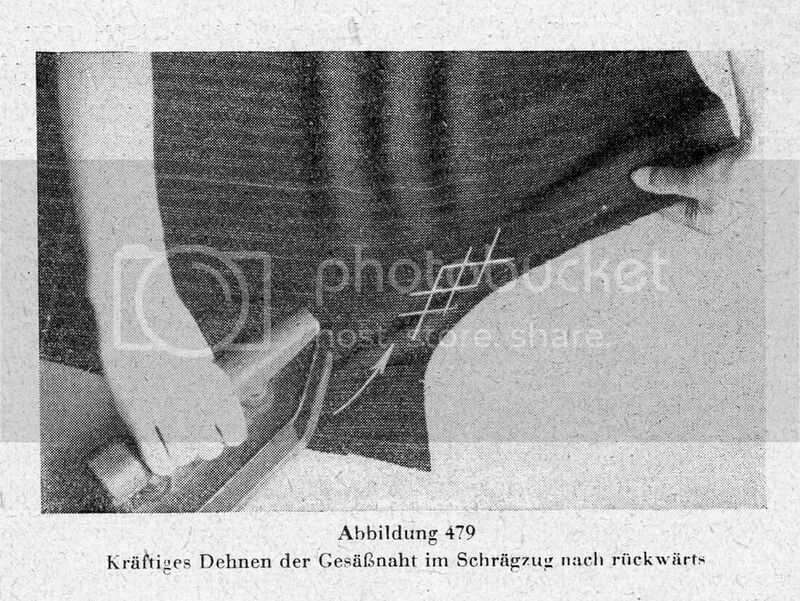 The cloth is pulled tautly with the left hand and advanced somewhat forwards by the edge of the seam. If the first forceful pass in the direction of the calf does not suffice, so that adequate length does not form in the break, and the side of the calf shape does not get pushed over to the break, the first angular pass can be repeated, only the pass is shorter. This is as shown in Abb 570. Place the iron on the hollow of knee and grasp the trouser in the breakline at calf height. Forcefully run the iron in a biased motion from the hollow of knee to the calf. This realises the greater ability of the cloth to stretch along the bias even with hard cloths that take to ironwork poorly, thereby winning a pronounced calf shape. This also avoids the need for any significant shrinking of the seam. Whenever too much shrinking is needed there is always the danger that it will slip back to its original form, as well as risking shine resulting from repeated work on the same spot. Once the necessary length has been achieved in the underside trouser break at the calf level, the usual round of calf in the inseam is so intensely shrunk in that the seam forms a perfectly straight line all the way down to the hollow of leg. 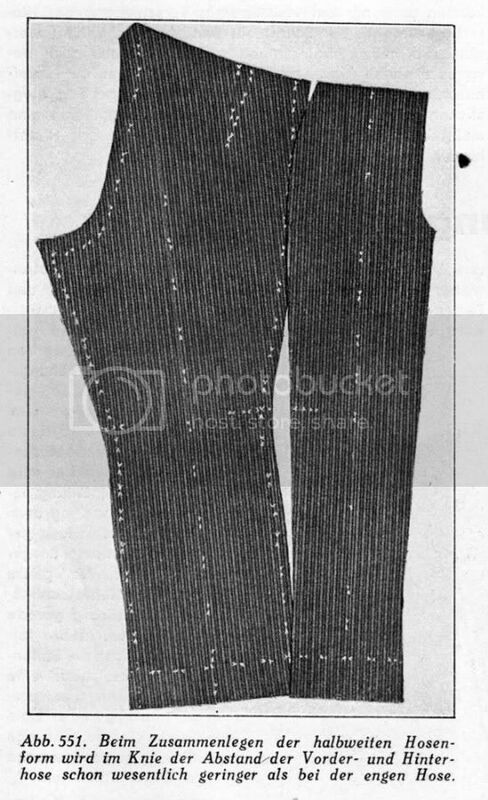 Preferably, the ironwork should be so forcefully carried out that the inseam even appears a little hollowed out as shown in the completed trouser form on the next page. Thereby one avoids the danger that the seams will partially slip back to the original shape and no longer be straight. 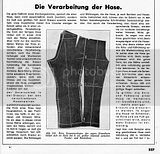 Should the fork and inseam be stretched at all? Opinion over whether ironwork should be conducted at all over the upper inseam and fork is highly divided. 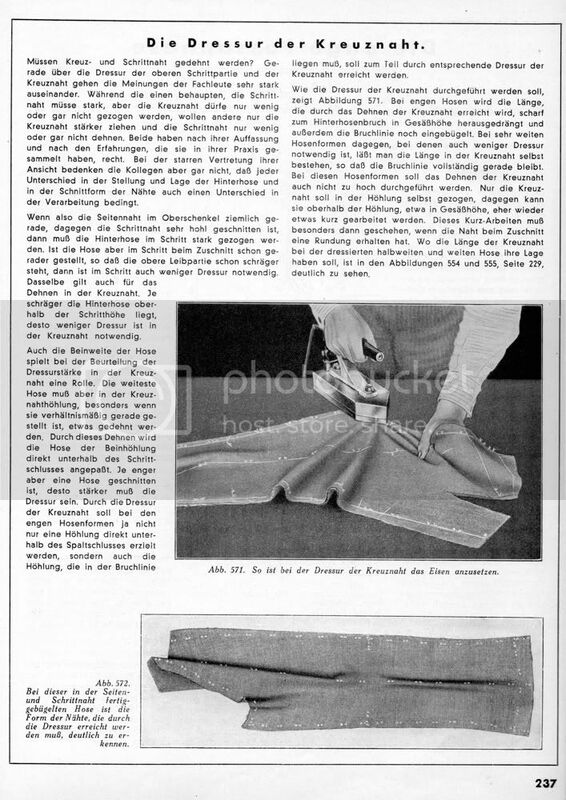 Some claim that the inseam should be stretched strongly and the fork only a little, others argue that the fork should be stretched more vigorously whereas the inseam only a little. Both views are, in a way, correct. Differences in the way the seams have been cut demand different ways of working them up. 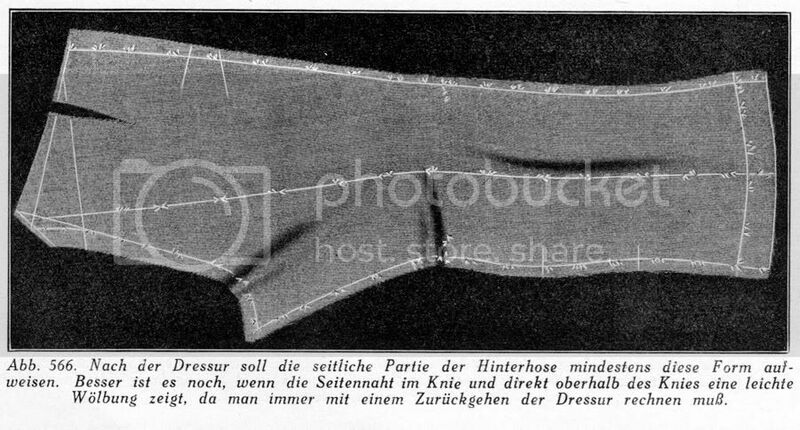 If the side seam at the upper thigh is fairly straight, and by comparison the inseam is cut very hollow, then the underside must be very vigorously stretched. However, if the trousers have been cut straighter so that the upper part of the torso is more crooked, less ironwork is required. The same principle holds true for the stretching of the fork. The straighter the undersides are at the top of the inseam, the less ironwork is required at the fork. The width of trouser leg also plays a roll in judging the vigour of ironwork at the fork. The widest trousers should be somewhat stretched at the hollow of fork, especially if it has been placed relatively straight. 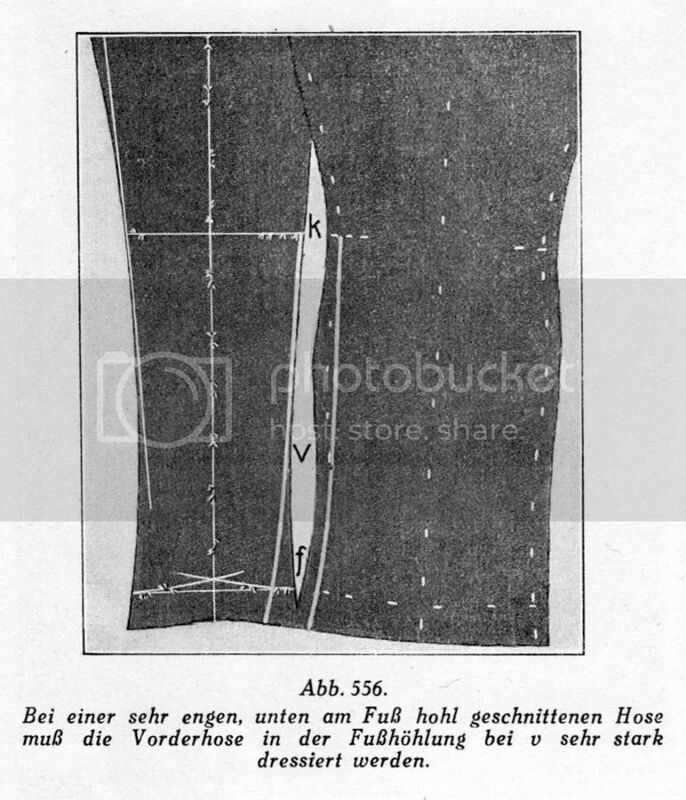 Through this stretching the trousers become fitted at the hollow of leg directly under the closure of the inseam. The narrower a trouser has been cut the more vigorously it must be worked up. Through the working up of the fork, not only is a hollowing directly under the closure of the fork attained, but also a hollow that must lie in the break line. Note how the iron is place on the fork. With narrow trousers the length that is produced through the stretching of the fork is pushed out towards the underside trouser break at the level of the seat. The break line is additionally shrunk in. By comparison, very wide trousers one should let the length remain in the fork, so that the break line remains straight. With wide trousers the stretching of the fork should not be extended too high up. Only the fork seam should be stretched at the hollow, whereas above the hollow around the level of the seat the fork is even worked short. This shrinking needs to occur particularly when the seam has been cut with a rounded shape. 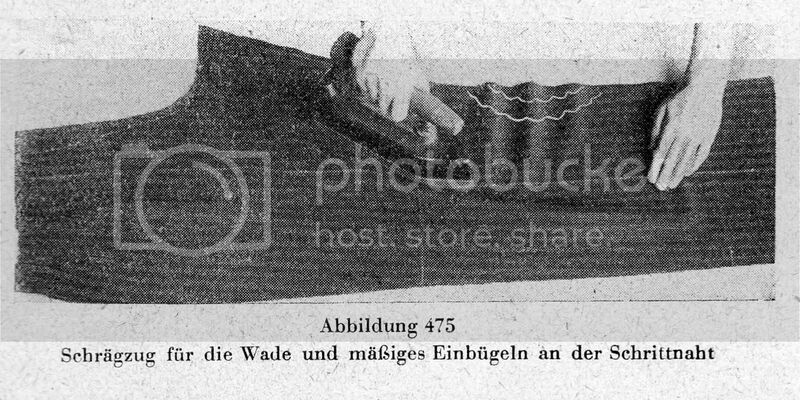 Where the length of the fork should lie on moderately wide and very wide trouser is shown in Abb 554 and 555. Abb 572: The completed ironwork with fully worked up side and inseams. The shape of the seams that needs to be attained through ironwork can be seen. Wonderfully clear, great to have such detailed pix! 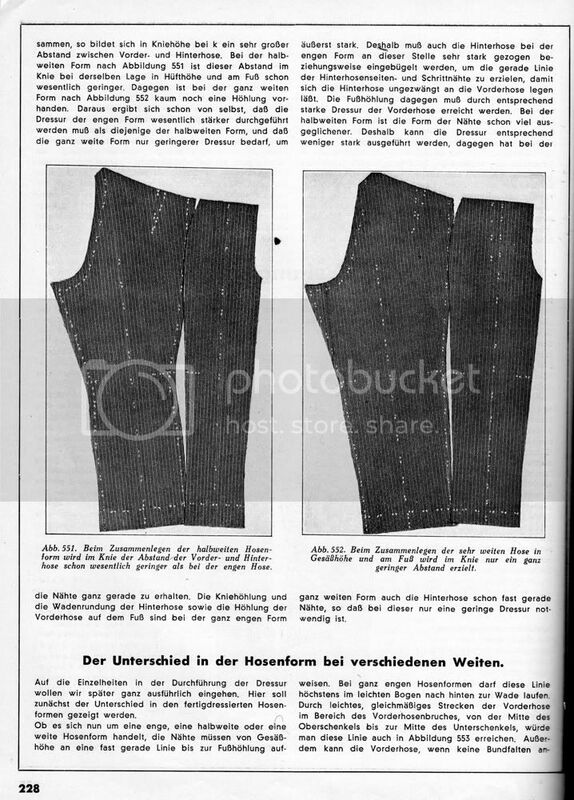 But what really is the point of all this shaping, beyond making a good impression when the pants are first tried on? It seems to me that a day's wearing stretches and distorts most pants considerably more, and mostly in the opposite directions. And are you supposed to take the pants back to the tailor for repressing as needed, or was this part of the skill-set of the average valet? I must say also that I've always been impressed (depressed?) with how disheveled, or at least rumpled, most everybody looks in old photos of the high-born and highly dressed, suggesting that in the heyday of this kind of impressive-sounding extra shaping and pressing finesse, it wasn't doing much good once the garment was in use… Or am I way off base? 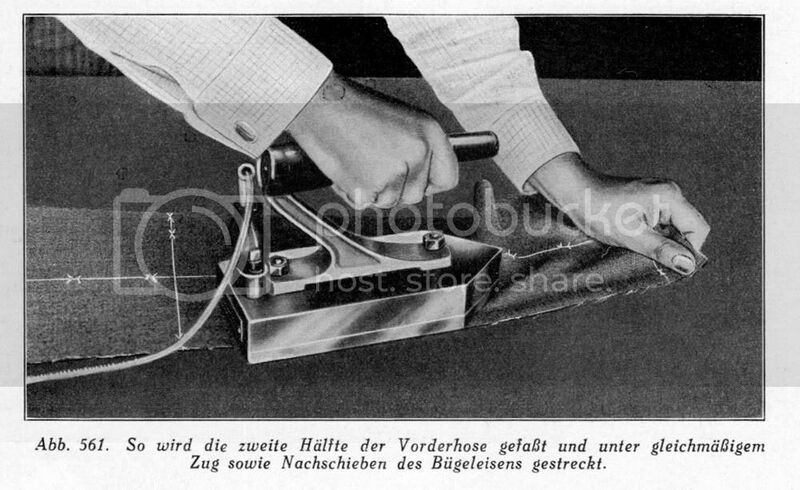 Very likely, since I've no experience of this level of work, on either side of the iron. But what really is the point of all this shaping, beyond making a good impression when the pants are first tried on? It seems to me that a day's wearing stretches and distorts most pants considerably more, and mostly in the opposite directions. And are you supposed to take the pants back to the tailor for repressing as needed, or was this part of the skill-set of the average valet? The rest of the manipulation is very subtle fit, but it is these subtleties that make the difference between a good trouser and a great one. It does need to be maintained with a proper pressing, but that is not outside the reach of the home valet, and one of the reasons it drives me bananas to hear about people taking a steamer to their suits! It ruins all the shaping! I’ll try to illustrate the difference on my next suit. If you're completely new to the concept of ironwork. check out this piece on the one piece back. As promised, shaping versus no shaping. The first shot is the fitting in which I did no shaping and sewed the seams straight with no allowance for fullness or stretching. Yuck. That's for David's benefit. Then I ripped them down, did the proper shaping and put them together properly. Much better. I went to your blog and was interested to read you feel the waistband should also be shaped. I look forward to you expanding on that. 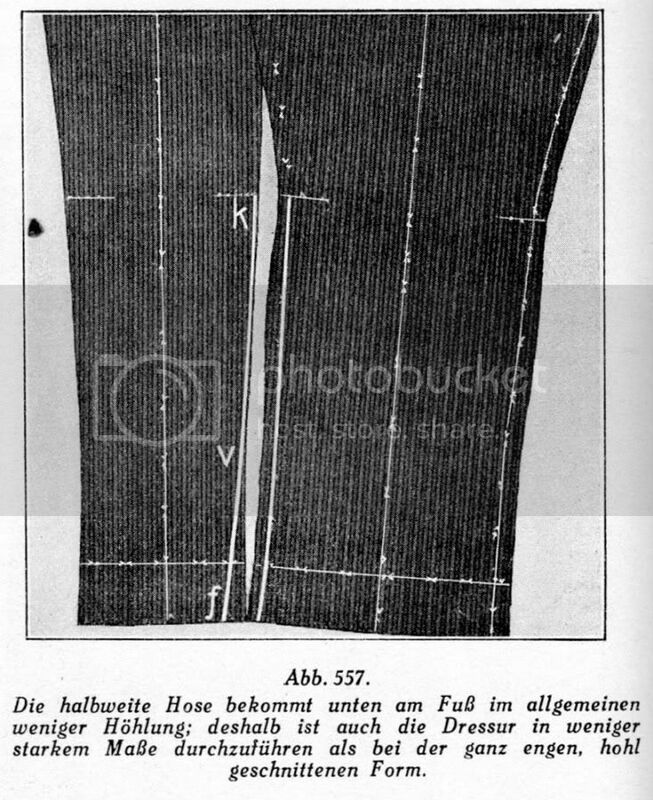 Just out of interest, I have had a suit finished for me at one of the more established tailors at the Row and the trouser has been shaped as you have done though the waistband is straight, and the turn ups are not quite so wide ( 1 1/2' - I am only 5' 8'' tall!) and I asked for them to rest on the shoe just a little - they also shaped the back of the bottom slightly lower then the front crease. I also had only one back pocket put in ( just my preference, of course). However in my Rive Gauche evening suit ( superb!! by the way - but alas it does not fit anymore) the trousers, which are low rise to be worn without belt or braces and have no adjustment tabs - the waistband is shaped just a little as it nears centre back - it is shaped up by about 1/4'' at the seam. that is the major shaping but there is also a very slight dip between the front pleat and the centre front, hardly noticable, in the trouser waist seam, to help lift that area - the trouser waist seam of the front is otherwise completely straight, as is the waitband there. In you blog you suggest that perhaps trousers are less capable of individuality or originality than coats (I hope I read it right!) but I must say the Saint Laurent's Rive Gauche ( at the time - i don't know about now) were immediately recognisable as Rive Gauche. They still seem to me to have an individuality particular to Saint Laurent. What type of iron would one use for this sort of shaping? 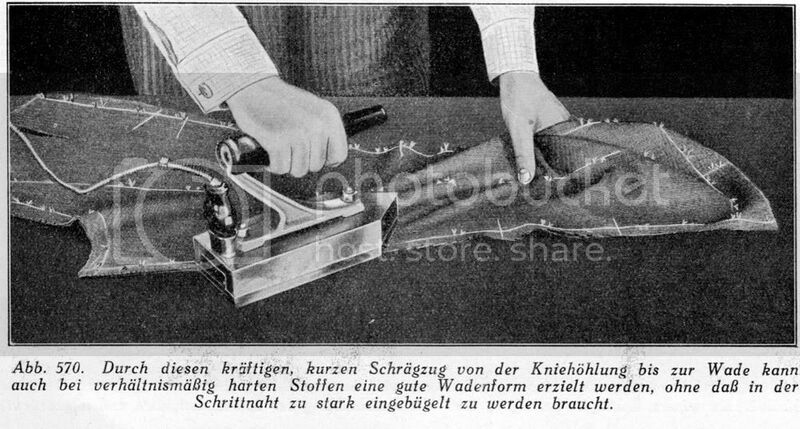 Back in the days when those pics were taken that heavy dry tailor's iron was the only option, but what about today's steam irons? They should speed up the process!? Oops- I forgot to show the waistband. It's cut straight, but shaped into a curve to follow the waistline better; you wouldn't be able to see the shaping on a finished garment, it will just hug the waist better. Photos tonight. I'm reserving judgement on the cloth until it's finished, but this is P&B. So far so good, though it frays like crazy. Oh ,and I agree that it would be nice if all trousers were made like this, but they wouldn't be able to sell them at Wal-mart prices. How do you do the waistband canvas? Cut it straight and shape it? What do you use for waistband canvas? I use a pressurized steam system, but in the past I did a modified victorian technique. Using a dry house iron, I sponged and pressed out the fabrics using a square of unbleached muslin. You can also use a linen press cloth, but it sometimes leaves a shine. Silly Cognoscenti, Drape is for windows! 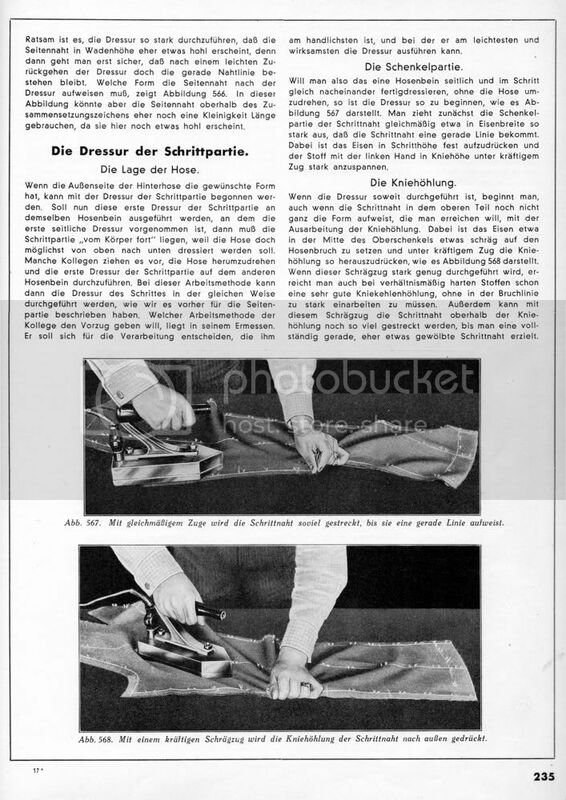 I have several heavy dry irons (mainly from Grossag) ranging from 4,5 to 6kg, which, along with a damp cloth, give a better result (sharper pleats and creases, flatter seams) than most steam systems (even with support of a suction table) would give. Especially when working with heavier fabrcs or those springy ones. I just bought 4 thin cotton handkerchiefs (1,50 Euros) which I use as pressing cloths. They could be a bit bigger, but given the price I can live with it. Did you wash that muslin first? I found that unbleached cotton muslin (Nesselstoff) is starched and will leave traces on the iron. Oh yes, they were soaked and washed. I would love to get my hands on a good heavy dry iron, but the ones I've found have been quite expensive. 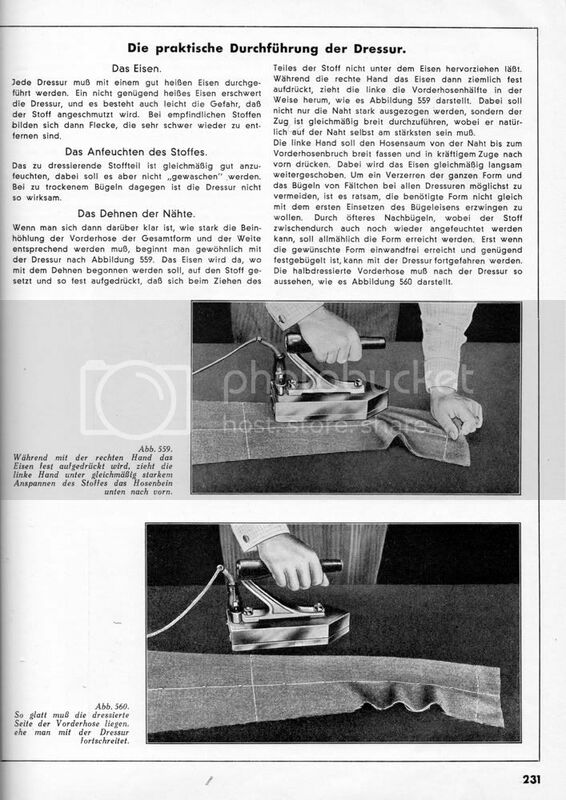 Is there a brand or a used specialists that might have a good heavy dry iron for an economy budget? Just let me know what weight you'd prefer. 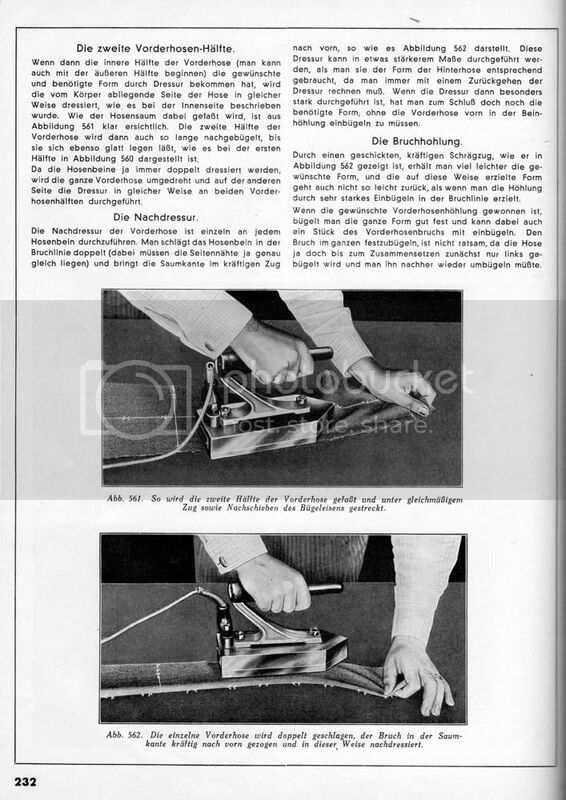 I mainly use an old iron which I got from Austria, so I have several spare ones from Grossag. All old but in good working condition. You are in Holland, so 220V should be fine. But you'd have to find the right plug, which is still available. The iron looks like the one in the first picture in the tools of the trade thread (red handle). It has a thermostat, which is absolutely necessary if you want/ have to keep it on for hours. It is made of ceramics, so it won't melt. Shipping with Hermes across the border is 14,- Euros. Just so nobody gets me wrong: I'm not a professional seller of such heavy irons, I just happen to have bought a lot of those (usually for little money), some are not working, I think 2 or 3 of the lot. That leaves me with 5 working irons, which is more than enough. In case somebody should be interested: shipping to USA is 45,- Euros or about $60.00. I'd say it's easier and cheaper to find one locally. Waistband is cut straight and then shaped. I use a wrapped horsehair which is not as stiff as haircloth and won't migrate; I cut 4 pieces with the hair running up, then stitch 2 together with a few rows of stitching to make 2 firm pieces. I like that better than commercial banroll which I have a harder time trying to shape. PLus it's much softer going around the waist than banroll. I have started making a pair of trousers, using a flannel fabric made of wool and a bit Lycra and it's easy to press it in shape. But what about those more rigid fabrics, those firm Frescos and Twills which may not allow that much shaping? Slashing the pattern in the places where the shaping would take place and open/ close it respectively to create the desired shape won't work. I don't want to waste my time and some fabric to try it out, so any input is welcome. 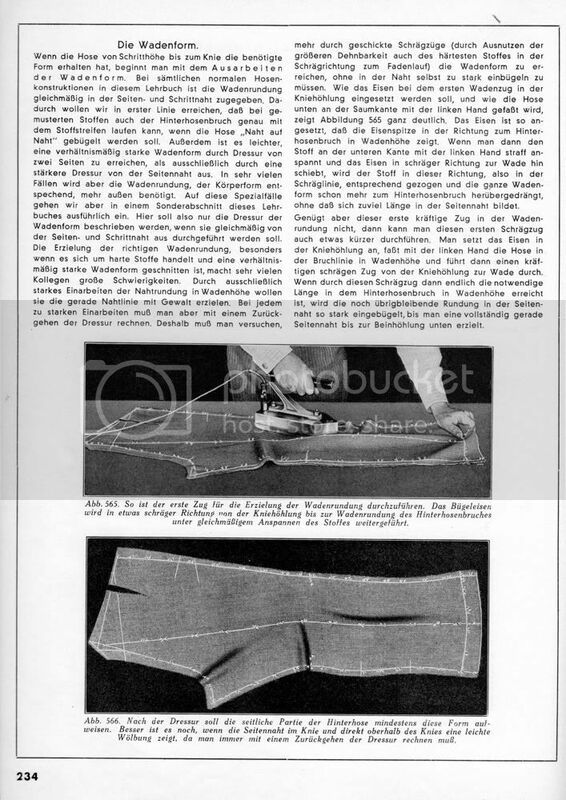 About waistband: In a tailoring booklet from 1937 (I think) they already cut it with the desired shape, slightly rounded. But that won't look good with patterned fabrics. Doesn't any one use wiggan or holland (or both) to interline the waistband, or is this more common for "grown on" bands? I can't speak to fresco, but I find some of the more rigid cloth, though sometimes harder to shape in the first place, actually keeps its shape better than soft cloth. Can German readers please check my translation of the final page. I had to guess what they mean by Spaltschluss and Schrittschluss.